Bidvest Services is the largest division in terms of employment (62 041 and consists of around 30 diverse companies, each of them focussed on building enduring business models characterised by high standards of quality, safety and reliability. With increased awareness and demand for environmental responsibility, Bidvest Services is adding green qualities to its business offerings as a key differentiator for winning and keeping business. Transformation of the workforce and supply chain to empower historically disadvantaged black citizens is a business imperative at Bidvest Services. Our progress in this area is a key factor when tendering for business with major public and private-sector operations. Accordingly, Bidvest Services employs a dedicated executive unit focused on the BEE scorecard endorsed by the DTI codes of good practice. We use the Group-wide data collection tool to highlight areas where performance can be improved. 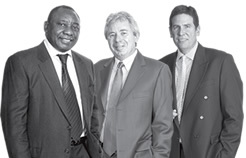 BEE ownership of Bidvest Services has remained at 26,7% and control has increased to 25%, while employment equity figures are better than the Group average. Prestige, with approximately 32 000 employees (50% of Bidvest Services employees), has obtained a BBBEE score of Level Two. A third of Bidvest Services’s carbon footprint results from the usage of coal for heating water in our laundry operations. We are conducting an investigation to replace coal with an environmentally friendly alternative. Rising to this challenge, Bidvest Services is positioning its business to anticipate the growing demand for greener products and services, at the same time reaping the benefit of efficiencies in the use of energy, water and other resources. Awareness of sustainability issues is growing among employees, with many initiatives being driven by line managers as part of their core business function. Despite the economic downturn, our staff complement has increased by 1%, from 61 407 to 62 041. Most employees are represented by the National Contract Cleaners Association (NCCA). Our policy is to foster good employee relationships and offer market-related remuneration packages. We often set the industry standard and even help the Department of Labour to enforce minimum wage standards elsewhere in the industry. We play a strong advocacy role, encouraging engagement with the NCCA on issues of common concern. Bidvest Services is in negotiations with various unions, with regard to the establishment of a national bargaining council for the cleaning sector. No significant strike action affected our businesses or employees. Employees are pivotal to our approach to sustainability. Well-trained, healthy, motivated employees allow businesses to maintain competitiveness and thus ensure customer satisfaction and retention. Developing and nurturing employees is central to achieving these aims. While the cleaning industry suffers from staff turnover rates of as high as 50% in a two-year cycle, Prestige, employing half of Bidvest Services’s employees, turn over the same proportion in five years of service.